When I was a kid, my parents used to get us take-out from our hometown Chinese restaurant, House of Hunan, and Orange Chicken was always in our to-go bag. I'm not sure if it was the sweet taste from the honey and orange or just the exotic name, but this dish was something we had to have every time we went there. 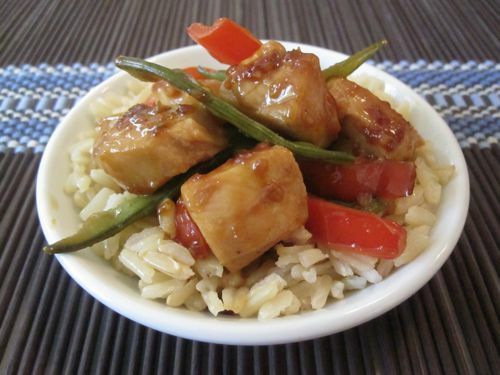 These days, I avoid MSG at all costs, so a lot of our local take-out Chinese food is off my list, but not wanting to deprive my kids of some of my childhood favorites, I came up with this healthy and delicious dinner treat that we all loved. With just the right amount of colorful vegetables and a tangy sweet sauce my kids were lapping up, this recipe was not only easy to make, but it actually made me nostalgic for my own childhood. House of Hunan, this one's for you! Love this recipe. I think I am going to try this over the weekend. Can I freeze it ? I can't believe something so simple to make tasted so good. my 2 year old, 3.5 year old, husband and I FINALLY all enjoyed the same meal at the same time. It's a Christmas Miracle! Thank you!!!!! Just made this for the first time tonight.... Hard for me to find one dinner that my husband, 5 year old, 1 year old will all eat willingly and without complaint, you NAILED it with this recipe! So good! Thank you! This was SOOO delicious! Easy, quick and healthy. Thank you! Made this for dinner tonight, Loved it!!! This is my daughter's FAVORITE thing to eat. I probably make it for her once a week. Its fantastic for us too, just added some spicy-ness! Delicious! My hubby even had seconds:) We like sauce pretty thick so I added about 3 teaspoons of cornstarch, but other than that it was really good. I tried to double the recipe and it came out watery. Any tips to avoid this in the future? Did you let the liquid reduce by half? If you're doubling the recipe it'll take longer to reduce! Was there another orange chicken recipe tht included sesame oil? we just made the orange chicken, our first attempt with a weelicious recipe. mmmm. Very Good. I am now trying to set up ziplist so i can have the ingredients list onhand when i can't figure out what to make for dinner and am staring aimlessly down a grocery store aisle.